It’s been a few weeks since I’ve been out on my bike for a run, rather than just running errands, and in fact, the last time, I just did old faithful – the Izu Skyline. 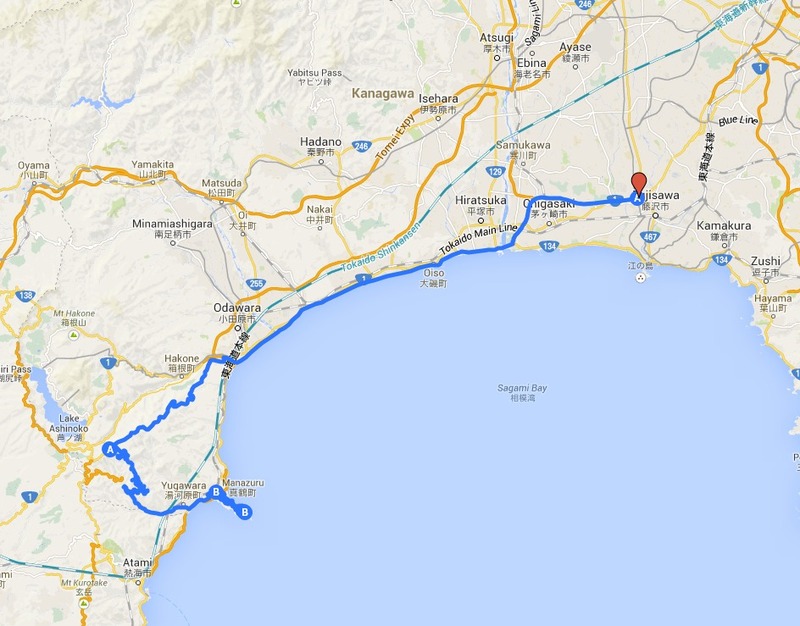 This time I decided to blend the old and the new, so I took my favourite ocean-side route 134 down towards Odawara, and then go up the Hakone Turnpike. It used to be called the Toyo Tires Turnpike, but now it’s the Mazda Turnpike. At the lower entrance they basically changed one cheap sign for another cheap sign. At the top, they’ve renamed the cafe area to the Mazda Skylounge, though aside from that, it’s business as usual – and there’s nothing wrong with that – a good chance to see people who love to get out on 2,3 or 4 wheels. I await a unicyclist at the SkyLounge for that single wheel addition. Sat outside the SkyLounge, on one of the benches with a view down onto lake Ashinoko, I was drinking some tea from my flask, and leafing through my Mapple touring map book, trying to find somewhere I could do in a couple of hours, and be back home in the early afternoon. It just wasn’t going to be Izu again I’d decided. 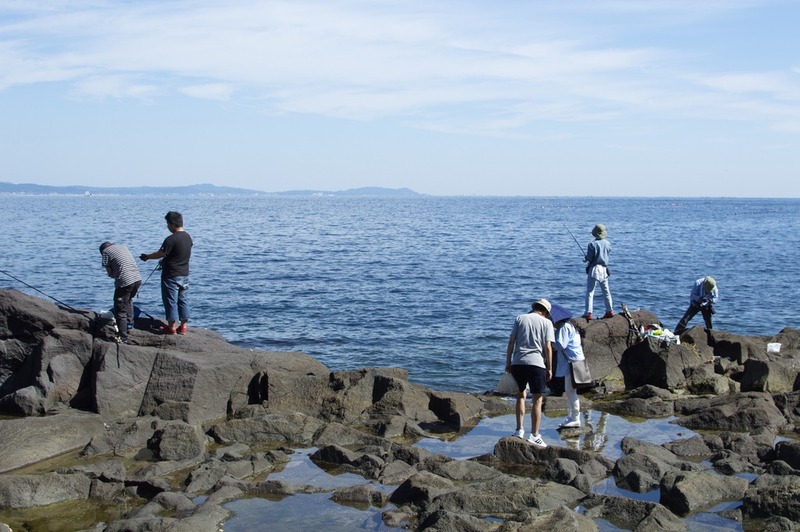 As I leafed through I noticed a small spit of land out into Sagami Bay, that just hadn’t registered with me before, I suspect as I’m usually on the coastal road, which lacks an exit near it – the small peninsula called Manazuru. Let’s not get ahead of ourselves though, first I needed to get from (A) The Mazda Skylounge, to (B) Manazuru. Fortunately for me, a nice way to get there is via Yugawara and Route 75, a playful twisty something, meandering down through the mountain valleys, with plenty of tree overhangs, shade, and more corners than you can shake a moderate sized stick at. It must be five years since I last used this road, and it’s a shame because it’s a lot of fun. 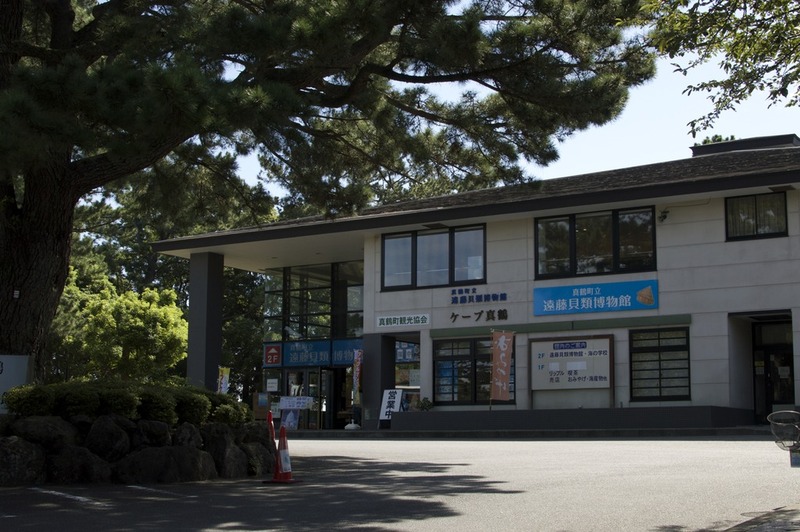 At Yugawara, at the base of the 75, it’s a short jaunt on that 135 coast road, but you jump off before the toll and express routes, and then in my case, headed for Manazuru station. I was wondering how these roads were going to work, as on the map there seem to me a mass of turn-offs in front of Manazuru station – and there are. However, after years of tourists, they’ve got it organised, with colour coded lanes to take you to different areas. Fundamentally, the 739 road loops the peninsula, but near the cape (as it’s called) a smaller road breaks off, but this is one way, and quite narrow, which is a good thing, as it keeps traffic flowing safely. I stopped a couple of times along the road to watch people sea fish off the rocks, see the literally fresh fish being dried, and listen to the waves. Riding on though, and onto the one way loop through winding lanes, you finally get down to Manatsuru Cape itself, and a nice large tourist area with car parks and bus parking. 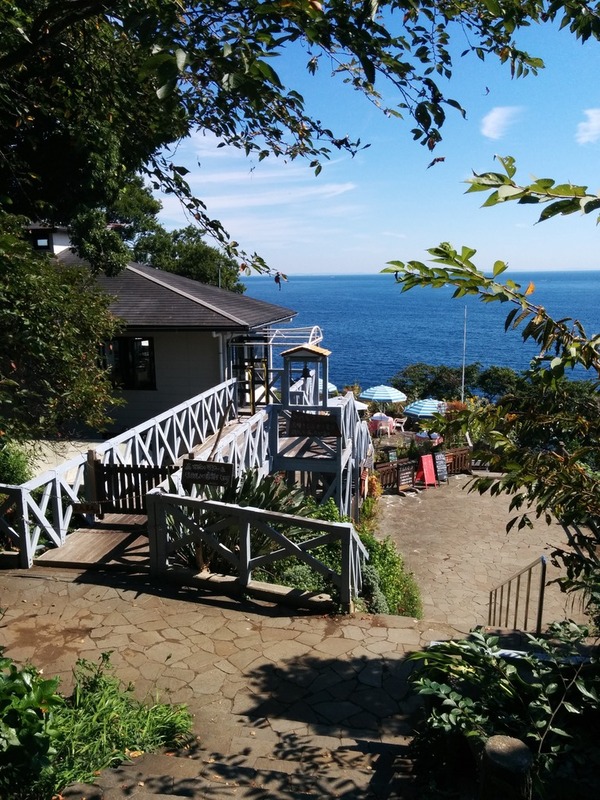 From the building, you can get a great view of the bay, it’s very scenic, but I hadn’t come all this way to look at the Pacific from the top of the cliffs – I’d come to touch ocean, and see the shrine. Well, not so much a shrine but, well the photo explains it. As far as I can tell, it’s called ‘名勝三ツ石’ or Meishoumitsuishi. Literal translation – ‘A place of beauty with three rocks’. As you descend by the steps though, there’s a nice looking cafe. I can’t recommend anything from there, as I was a little early for it to open, but it looked very inviting, perched on the sloping rocks with a grand view of the ocean. At the base of the slope are some toilets, then the pebble beach. The large rocks at the end of the spit are often cut off from the coast when the tide is high, but when it’s low, you can walk out towards them on the rock causeway. You have to be careful on the rocks, and there are thousands of beetles and such, but it’s nice to get out around the waves, and if you’re up for it, try to catch some small fish or shellfish. 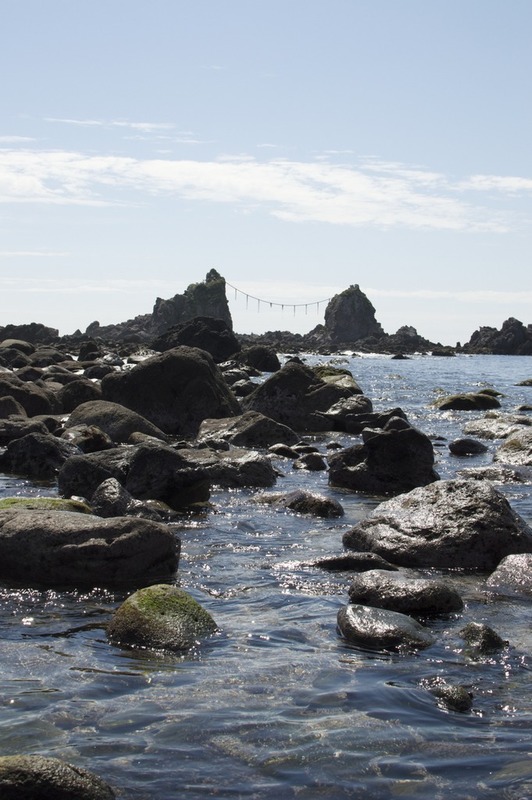 The rocks themselves, between two two of which are stretched some Shinto based paper streamers on a long rope (called shime 標, or even a rope version shimenawa), look quite striking against the surf, and it’s easy to see how people living near here in times past would want to make an acknowledgement to the gods of the sea. All it all, it’s quite a fetching place, and somewhere you can sit for a while and just look out over the vast Ocean. You’ll likely want that rest too, before the hike back up the steps. The building at the top of the cliffs is nice, but it’s nothing special, if you’ve seen one tourist targeting restaurant selling local food and trinkets, you’ve pretty much seen this one, but it’s got a great view, the menus seemed OK (again, it was too early to try), the staff were nice, it had some nice places to sit outside, and vitally, the toilets were clean. After I’d drunk some more tea on the lawn over the cliff, I could feel the bike calling me, so off I went again, giving cyclists plenty of space on the bumpy road, but actually not so far, as another building came into view, and in front of it, the Manazuru Fire Station, which is a simple building with large glass windows, showing off the single fire engine. It looked quite nice in it’s own way. The building just behind it looks like a large converted house, in some old, and non-Japanese style; at first glance it looked almost south east Asian colonial – yes, I’m not much of an architectural scholar. 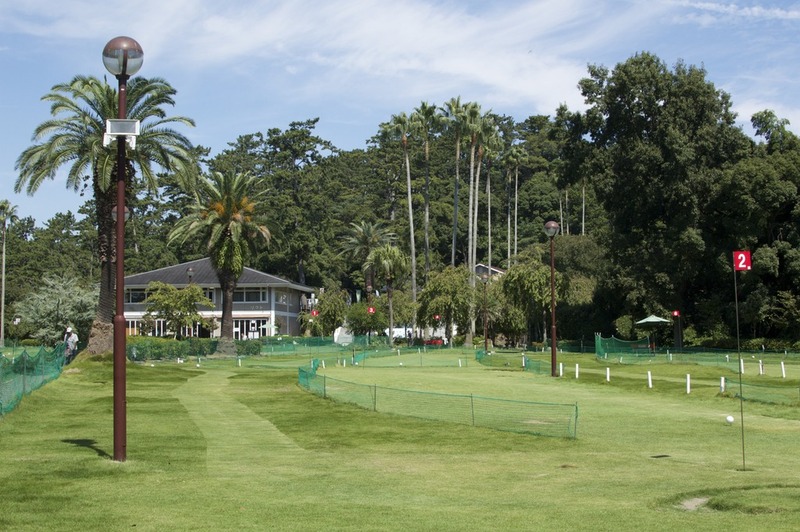 In front of the house, what was once likely a large stately lawn, has been quite tastefully converted into a miniature golf course. Walk past this, through the palm trees, and again there’s a beautiful cliff-top view of the ocean. I think this is all a part of the number of hotel resort facilities in the area, for those who want to come down for several days. There are lots of things to see on this peninsula actually – I’d quite like to come back for a full day and walk around a lot more to see more of them, and once you’re here, on foot is a good way to do it. Of course, two wheels are the best way to actually get here. I made a Google Map link, as the image above is a grab – it didn’t want to show for some reason. However you get here though, the compactness of the area makes it worth the trip.